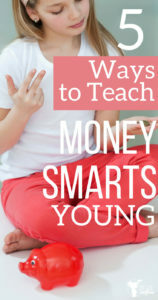 Do you have money smarts and are you teaching the art of money smarts to your kids? If there was a list of things that cause heartbreak and stress in life, money would be at the top of that list. Money is one of those necessary evils that everyone needs in order to survive. If you don’t learn how to control your money, your money will control you. I have seen money tear families apart. I have seen families struggle just to make ends meet because of massive credit card debt. Just like anything in this world, money can be a blessing or a curse. The trick is to teach your children at an early age to really understand how to manage their money. Here are some ideas that we have incorporated into our family that we have seen be overall beneficial. #1 – Have your child start a balance book that contains all of their money happenings. When my husband and I first were married he showed me his spending book when he was a little boy! It was fascinating to see how he earned his money, and what he chose to spend it on. I was very intrigued. We decided early, we wanted to do this with our boys. When they earn money this is the process. Create 3 columns. 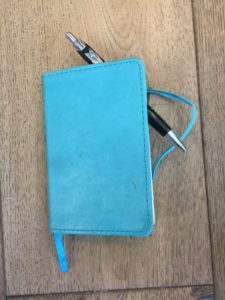 A small on for the date, a big one for a description of where the money came from and a smaller one for the amount earned. When your child earns some money, have them mark where it came from in the description column, and how much in the money column. Have them subtract out any expenses (see #5). Total it out and create a new balance. This process teaches adding and subtracting with decimals. It teaches them how to keep a balance sheet. If they turn in this book at the beginning of each week, and its up to date, they get their allowance of $1.00. It is the beginning stages in teaching them how to manage their money! #2 – Teach your children to never spend what they don’t have. This can be hard to follow through with this at times, but the lessons learned will hopefully benefit their lives as they grow older. I always tell my boys that if they want to buy something at the store I will NEVER lend them any money. I teach them that borrowing money isn’t that simple in the real world. They know that if they borrow money in the real world, they have to pay “interest”, sometimes double what the actual item costs. It’s better to wait a little longer until you have the money, before you buy something. I couldn’t help holding back a smile! It’s OK buddy! We all cry when we see how much taxes we have to pay! His brother graciously gave him money from his own bank so he could have enough for taxes (proud mommy moment there). We head to the store. Unfortunately, the set he wanted wasn’t there so he chose 2 cheaper ones instead. He was so excited!! We get to the check out line and he is ready to pay for his 2 sets. The cashier rings up the Lego sets and it is almost DOUBLE THE MONEY of what my son has. Inside I was like, “OH CRAP! This is not good!” I asked her to check the prices again, and one Lego set must have been put on the wrong shelf because it was double the amount we thought it was. I knelt down and talked with my son who is still trying to digest what was happening. 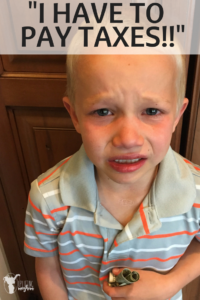 He then asked through tears if I could borrow him the money! OH MAN! This was so hard, but I told him NO. I could feel the eyes of the cashier all over me. I’m sure she thought I was such a mean mother. My son begged one more time, but I gave him the option of buying the smaller set or continue to save for both of them. He opted out to just buy the smaller set. We left the store and he was all smiles. Now I’m not sure this experience wasn’t life changing, but hopefully it will instill in his mind the importance of never buying things you don’t have the money for. #3 – Provide opportunities for your child to earn money. If they are given many opportunities to earn money, then they will have more experiences to manage and handle their own money. They need to know how it feels to work hard at something, and get paid doing it. Satisfaction in a job well done. You don’t earn money without working for it! Enough said! #4 – Allow them to spend what they have earned. This might sound crazy, but there is a reason behind this madness. I have seen my boys want to buy something so ridiculously cheap, I just know it will break in the first 5 minutes (you know the toys I’m talking about!) However, even after explaining this fact to my kid, he still wants to buy it. OK great! He spends HIS money, it breaks, HE LEARNS. If they are allowed to learn young under the supervision of their parents, they may learn to not make similar mistakes as they are older. (ON A MUCH BIGGER SCALE). When my kids buy a toy they have been eyeing, they know that once that money is spent, it is gone. They need to work for more money, and begin saving again! When we are at the store and they ask if I can buy something for them. I simply say, “Did you bring your money?” That usually quiets them real quick. #5 – Teach them to save money for the FUTURE, FUTURE. How you do this is completely up to you. You can have your child save for college, a car, a mission etc. We have our boys saving money to serve an LDS mission, and we teach them to pay tithing which is a charitable donation to the LDS church. When they learn at a young age, saving and giving become second nature. 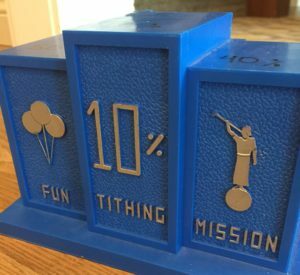 Of everything my boys earn, 40% goes towards their mission, 10% goes towards tithing, and the remaining 50% goes towards their “fun fund”. You can get a bank similar to this one HERE or others with 3 slots like this adorable owl bank or this cute sports bank. I love watching my boys faces light up when they count how much money they have saved in their missionary fund. At first it is difficult for them to put half of their money towards something else other than their immediate wants. Now my boys don’t question it. They know where their money is going and the importance of it. I hope these 5 things help your kids begin to understand the importance of managing their money! 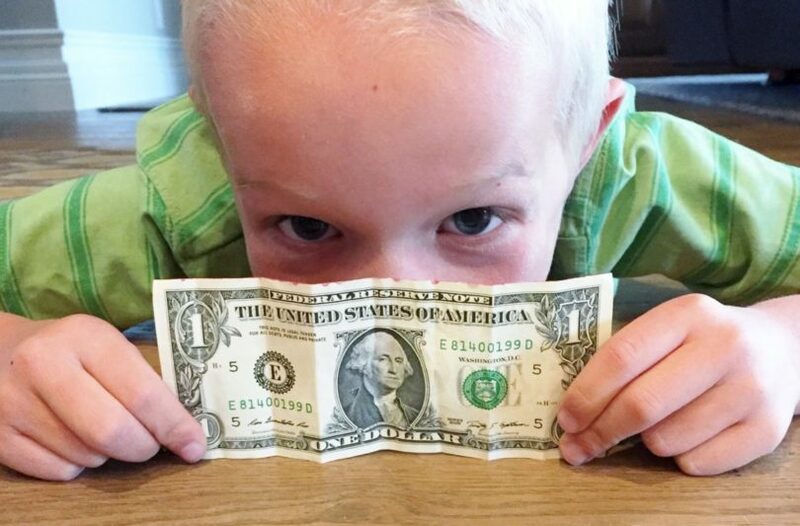 Here is part 2 of teaching money smarts to your kids. What other way have you found have helped you and your family?